Treble hooks – do they do more damage to fish than singles? I’ve recently received a few adverse comments about my use of treble hooks on lures. I took this criticism to heart and set out to see if there was a sound scientific basis to the proposition that treble hooks cause more damage to fish than single hooks. I found the answer to this question in a fascinating book called Reviews: Methods and Technologies in Fish Biology and Fisheries; “By-Catch reduction in the World’s Fisheries” – edited by Steven J Kennelly. The ISBN number is 978-1-4020-6077-9. This book devotes an entire chapter to the “Fate of fish released by Recreational anglers” and has a section entitled “Single versus treble hooks” which sheds some light on experiments conducted to quantify the damage caused by single and treble hooks. The chapter was written by Steven J Cooke and Gene R Wilde. “Muoneke & Childress (1994) reported that single hooks tend to be more deeply ingested than treble hooks. However, if treble hooks are ingested, they almost certainly result in massive injury or mortality. In a meta-analysis of salmonids, Taylor & White (1992) failed to demonstrate a difference in mortality between these two hook types. Diodati & Richards (1996) also determined that treble hooks were associated with lower mortality rates than single hooks for striped bass because the latter were more likely to be swallowed, resulting in a greater occurrence of gut hooking. DuBois & Dubielzig (2004) reported that treble hooks hooked and held more brown trout (Salmo trutta), rainbow trout, and brook char (Salvelinus fontinalis) than single hooks, but that there were no differences in the frequencies of severe injuries (i.e. eye or gullet) or mortalities. Similarly, Jenkins (2003) reported that treble hooks and single baited hooks lodged in the oesophagus of rainbow trout at similar frequencies. Conversely, Ayvazian et al (2002) investigated the effects of different hook designs on hooking injury and mortality of tailor (Pomatomus saltatrix) in Western Australia. The authors reported that treble hooks resulted in a significantly greater mortality rate than did other hook types. The authors concluded that their current management strategies, including discouraging the use of treble hooks, should be effective in ensuring the survival of a high proportion of discarded tailor”. So, in short, the experimental results seem to be biased in favour of treble hooks over single hooks rather than the contrary. I would like to point out here that I flatten the barbs of treble hooks with my pliers before casting a lure for the first time so they are effectively barbless. There are two reasons for this. One it makes the treble easier to remove from the fish and two it makes the treble easier to remove from yourself, should you end up wearing the treble during the unhooking process. In 35 years this has only happened to me twice. In-line single hooks are an excellent choice to replace trebles on lures should you wish to do this. They do not seem to affect lure action too dramatically. 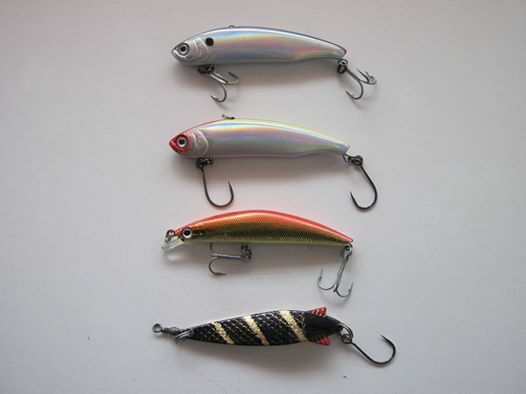 Having said that, the actions of certain lures can be changed irrevocably when treble hooks are replaced with singles. I always check the action of the lure when I change hook types and make a call as to whether to continue with singles based on how the lure performs. In conclusion, I will continue to use treble hooks with flattened barbs and wherever possible replace them with in-line singles.